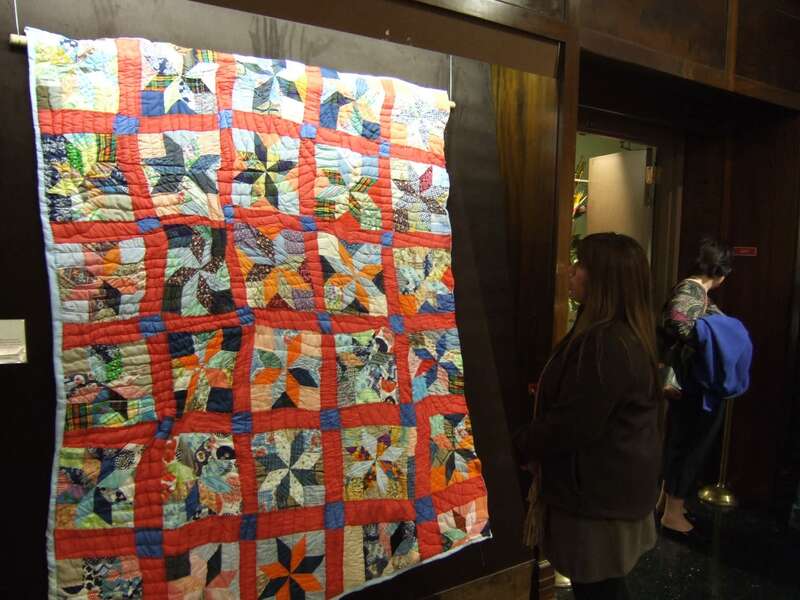 The latest permanent exhibition at WKU’s Kentucky Museum, the Richardson Quilt Gallery, opened to visitors February 24. With two dozen quilts and historic textile samples collected by Elizabeth Richardson and donated by her daughter, June McGuyer, in addition to 15 Star pattern quilts from other donors, you are surely in for a treat when you visit this gallery. As I waited to shake Ms. June McGuyer’s hand before entering the gallery for the first time, a bystander in front of me thanked her for sharing such precious memories with total strangers and without another thought, Ms. McGuyer whispered, “Well, I didn’t have any daughters.” In just a single sentence, it took me back to my childhood, and the countless quilts my grandmother has made me. You enter my Mamaw’s home, and the first thing you’ll see is thread, needles, and all kinds of various colors of material. Growing up, I never really thought of these quilts as precious or priceless, they were just my usual gift from Mamaw. However, after entering the Richardson Quilt Gallery, I realized my Mamaw wasn’t just giving me a gift, she was giving me memories I could cherish forever. At the Richardson Quilt Gallery, you’ll feel as if you stepped back in time with some of the quilts displayed on the Museum’s collection of antique beds. The quilts appear much more real and useful in this way, just as I’m sure Ms. McGuyer’s mother intended them to look when she made the quilts. The dark oak walls and hard wood floors of the gallery add so much character to the various colors of quilts, and make the reds look redder, the blues look bluer, and whites look whiter. I enjoyed reading the inserts to each quilt and finding out where they came from and what year they were likely made. A quilt can be just any old quilt to a stranger, but each one has a story waiting to be untold, and I think the Richardson Quilt Gallery allows just that opportunity. When you are in Bowling Green, stop by and visit the Kentucky Museum to view the new gallery, and maybe, just like me, you’ll learn a whole new appreciation for your grandmother.